Yesterday afternoon, the Moetzes Gedolei HaTorah met in the downtown Manhattan offices of Agudath Israel of America. 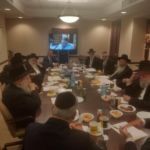 Participants in the meeting included (in alphabetical order): Rabbi Simcha Bunim Ehrenfeld, Mattersdorfer Rov (by Tele-Conference); Rabbi Aharon Feldman, Rosh HaYeshiva, Yeshivas Ner Yisroel; Rabbi Yosef Frankel, Vyelipoler Rebbe; Rabbi Shmuel Kamenetsky, Rosh HaYeshiva, Yeshiva of Philadelphia; Rabbi Aryeh Malkiel Kotler, Rosh HaYeshiva, Bais Medrash Govoha; Rabbi Avrohom Chaim Levin, Rosh HaYeshiva Telshe Chicago (by Tele-Conference); Rabbi Yaakov Perlow, Novominsker Rebbe and Rosh Agudas Yisroel; as well as Rabbi Elya Brudny, Rosh Yeshiva, Mirrer Yeshiva, and Rabbi Yakov Horowitz, Rosh HaYeshiva Yeshiva Beis Meir. 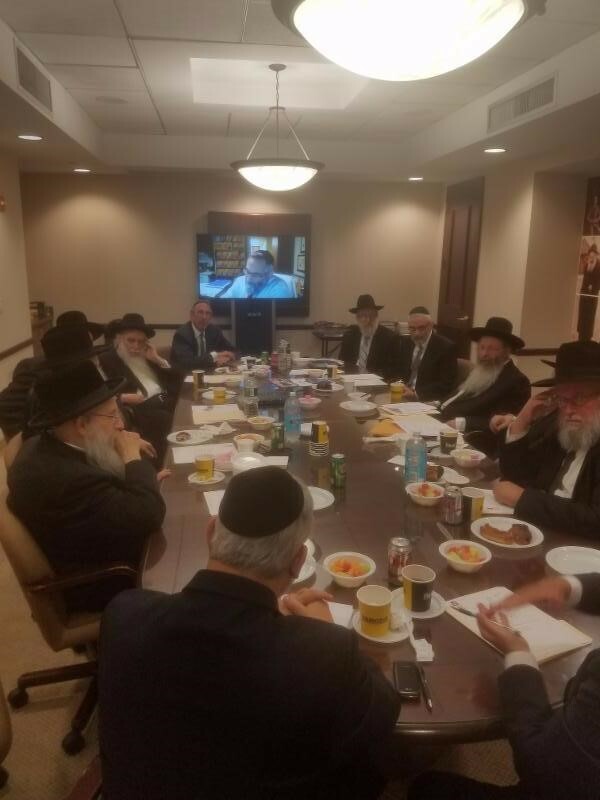 Agudath Israel leaders who participated in the meeting included Rabbi Labish Becker, Rabbi Shlomo Gertzulin, Dr. Irving Lebovics, Mr. Shia Markowitz, Rabbi Avi Shafran; Mr. Shlomo Werdiger; and Rabbi Chaim Dovid Zwiebel.